Explanatory notes on ‘what to expect’, discussion of options & answers to common queries. Mothers want information that is up-to-date and evidence based; socially disadvantaged mothers want at least as much information as other groups. Prompts for midwives to discuss various public health issues which are relevant during pregnancy e.g. employment rights, emotional support and domestic violence, the baby friendly initiative, smoking cessation. Details of family history consistent with recommendations from working party of the Joint Royal College Committee on Medical Genetics. Guidance for professionals in accordance with national recommendations and facilitates individualised management planning. Supports a comprehensive risk assessment at the onset of labour. Facilitates CTG interpretation in line with NICE Intrapartum guideline. 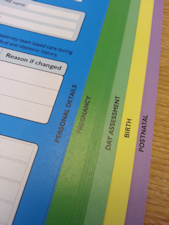 Encourages documentation of an individualised management plan for labour and delivery. Includes space to demonstrate discussion has occurred prior to procedures being undertaken. Prompts the midwife to discuss various public health issues e.g. breast feeding, smoking etc. Enables comprehensive risk assessment after delivery, to include relevant details from the antenatal, intrapartum and immediate postnatal period. Encourages documentation of an individualised management plan for the immediate postnatal period.